Oh y'all, I need to apologize! The post about pansies and chili was just me (rather ineptly apparently) trying to make a point about how quick the chili was to make when one is unprepared for guests, not that I didn't want my friends to come over. When I was told that my blog is "intense" in my desire for people to not come to my house, I realized that there had been a misreading somewhere along the way. Cooking and entertaining is my primary focus here! I'll stick to the recipes, and avoid tongue and cheek stories from now on. The last thing I want is drama, and that was what I ended up getting (sigh). Spice and Sass will now be 100% non-facetious (or at least I'll try). Now that's out of the way, I did in fact get to plant my pansies this weekend. Hee. First was Peg and Hunter's before Greek-Fest. I dressed like a gypsy to fit in. It was Beth's first Greek-fest, and I think she is a fan- Beth, am I correct? After a night of Opa-ing it up at Greek Fest, I woke up early, picked up some Chick-fil-a for us, and entertained some workmen and contractors around the house. I had the perfect Southern Saturday. Hubs sat a radio in the window for me, so I got to play in the dirt while listening to the Dawgs play the Vols. He caught me taking a break. After all that hard work, and honor of South Carolina's victory, I decided that chicken pot pie was in order. I adapted the Pioneer Woman's, trusting that it would hit the spot. It did. Throw your chicken pieces in a stock pot, and cover with water. Bring to a boil, then lower the heat and simmer for about 25 minutes. Relax. Chop up your veggies- be sure to leave some of celery leaves in there for some extra celery flavor. Take the chicken out of your pot, and let cool. Melt the butter in a dutch oven, or large saucepan. Toss in the veggies and saute for a bit. Mix your chicken in with the veggies. Sprinkle your flour on top. Stir it evenly in. Add the chicken broth and the chicken bouillon cube and cook for a few minutes. Add the cream - turn the heat up and cook at a high simmer for ten to fifteen minutes. Take it off the heat when the bouillon cube is dissolved and everything is thickened up. Season with a heaping teaspoon of ground thyme and salt and pepper to taste. Pour half the pot pie filling into one pie pan, and the other half into another pie pan. Top with a pie crust, and cut slits on top. So, did y'all watch all the good games this weekend? it was probably best that I listened to the UTY UGA game in relative solitude. I might have gotten egged by my friends here in East Tennessee had I joined them. I know things got a bit heated during the Florida-LSU game! I read that post and didn't get any complaining out of it.. I guess some people just look for drama! I'm a new reader. And now that I know you're a Dawgs fan, I will definitely be back! LOVE your break pics - you're so cute! This pie looks FAB! Can we talk about how cute your yard/house is? Cause seriously. I'll always be happy for pansies, they are my sorority flower, and yours look darling! Heart your Tennessee flag! I had one hanging outside my place on Capitol Hill when I lived in DC, but when I moved to MD, it just did't seem right...not to mention the HOA doesn't allow flags! You didn't need to apologize, but sometimes apologizing just makes things easier for everyone. I just love you! 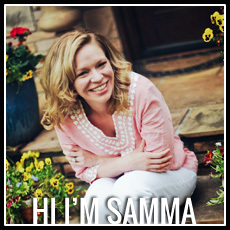 Loving the pansies, Samma Faye! Hooray for Georgia and South Carolina wins this weekend! You look positively adorable in your chair. Oh Lordy... people actually thought that?! I for one enjoy the facetious posts! And now I want chicken pot pie. Damn it. You do you, we love it! And the pot pie looks delish. YUM! I love chicken pot pie! Will you please mail me some?! And I love your steps! They looks fantastic! Glad you got to plant your damn pansies. They are precious. I love your SASS...isn't that 1/2 the title of your blog? You get a pass for sass! Love you!!! Ok Samma, I am not even gonna ask who got their feelings "hurt" because it will just make me boil. SO my advice is to keep doing what YOU do because that is what keeps us coming back for more! It was a cute, funny post not a bitchy, mean one:) You are like the nicest person I know (and I have known you like since birth so I would say I am a good judge!). Sweet of you to apologize, but no need to really. You are blogging, it is like venting in a comical computer way!!! Love to you! And FYI...so jealous about Greek fest! Tell Beth I said hi! Sorry someone got bent out of shape about your post. I didn't get the impression that you didn't want guests at all. You're always such a sweet hostess and entertaining for your friends! Your front steps look picture perfect with the flowers and pumpkins and I love your Adirondack chairs. Looks like the perfect shady spot to read a book. loving your headband and the pot pie looks out of this world. I am a new follower of your blog and loving it! I had a similar situation when I mentioned being "over new years eve". You would have thought I ran over a first born.